This morning BikeBiz ran a story about the upcoming Road Safety Week, starting Monday 17th November. Almost immediately we received a number of responses from cycle advocates on Twitter not entirely pleased we had given the week any publicity. Why? Largely because critics feel Road Safety Week places far too much emphasis on vulnerable road users – like cyclists and pedestrians – to change their behaviour, rather than motorists, for example, the mistakes of whom clearly have more dangerous and sometimes fatal consequences for other road users. Critics also condemn RSW for not targeting councils and governmental departments that create road infrastructure in the first place, who also, clearly, have a huge opportunity to make roads safer for all. If you’re not convinced the ‘victim blaming’ culture is alive and kicking, just take a look at some of the coverage surrounding Chris Boardman, where his refusal to wear a helmet overshadowed the messages he was trying to put across in his work with the BBC. Road Safety Week is the brainchild of road safety charity Brake. It started in 1997, aiming (in their own words) "to raise awareness about road safety and promote steps that everyone can take to stop needless deaths and injuries year-round". BikeBiz: So, is Road Safety Week putting the emphasis on road safety solely on vulnerable road users like cyclists and pedestrians? 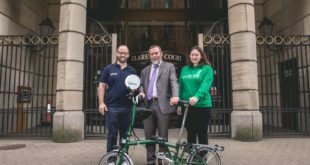 Philip Goose: Our Road Safety Week campaign is quite the opposite – we recognise that 4% of miles travelled in the UK are made on foot or bike, but vulnerable road users make up almost half of road deaths. Up to 95% of crashes are caused by driver error, so it is therefore vital that drivers take responsibility to protect themselves and everyone around them. BB: What would you say to people who think Road Safety Week should be more focused on things like infrastructure and better cycle lanes, etc? PG: Firstly, behavioural change is an important step. With 75% of cyclist collisions occurring at or near junctions, it is vital that drivers are literally ‘looking out for each other’ and always checking whether a cyclist may be there and not assuming it is safe to turn. As part of Road Safety Week we are also campaigning for 20mph limits as the default urban speed limit. It is proven that every 1mph reduction in average speeds causes on average a 5% reduction in crash rates – and that is only one benefit. We are also fully behind increased funding for infrastructure to make sustainable transport safer and more attractive. Through two of our recent surveys we know that three in four schoolchildren wanted to walk or cycle more, and another showed that a third of non-cyclists would cycle if routes were safer. BB: What’s your message to cyclists weighing up whether to get behind Road Safety Week? PG: We would love everyone who cycles to get behind Road Safety Week, whether you cycle to work or to the shops, whether you like touring around the countryside with your family, or racing or taking part in sportives with your local club. ‘Look out for each other’ is all about how we can do more to stop the five deaths and 61 serious injuries every day on UK roads. Drivers have a particular part to play in this, and as cyclists many of us drive, or know people that do, and we can all play a part in influencing driver behaviour. We can also as individuals all call on our local politicians to implement 20mph urban speed limits and safer infrastructure for all road users. As part of Road Safety Week we will be revealing statistics showing the shocking number of drivers risking lives by flouting traffic laws. Keep an eye out for these on 17 November!"